The human mouth can experience all sorts of problems from the way it feels to the way it looks. You might need gentle dental care in Fayetteville, GA, if you’re experiencing any pain or sensitivity or if you have any white spots growing on your teeth. Or, you might need urgent dental care in Fayetteville, GA, if you hit your mouth and accidentally chip or crack your tooth. Whatever the case, there are a number of reasons why you should take care of it immediately and not wait around. You may believe that you can treat problems yourself or use some kind of home remedies, but it always helps to get a professional opinion. For one thing, you can’t always figure out the cause yourself, so you could be treating the wrong thing. 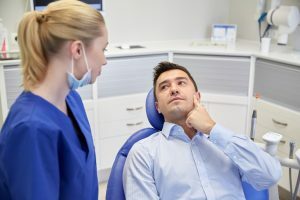 If you get professional dental services in Fayetteville, GA, they can help you figure out what’s wrong in the first place and then give you the correct treatment for the problem. There is a wide range of diseases and conditions that can affect your gums and teeth, and in order to fight them, you first need to identify them correctly. No problems in your mouth are going to get better over time; they can only stay the same or get worse. It will look worse and get more and more damaged. If a tooth is decaying, for instance, it will continue to decay until you see a dentist. Sometimes, you may feel less pain, but that can actually make the situation worse, too, since you’ll be using that tooth more than you should. Even if you get lucky and the pain doesn’t get worse, waiting longer means you still have to experience more pain over time. If you get gentle dental in Fayetteville, GA, then you don’t have to go through any of that. You don’t have to decide how many pain killers you want to take or spend time putting ice on your jaw. You can just get it over with and have it done. If your teeth start to deteriorate, they’ll get harder and harder for your dentist to treat, which ultimately means higher bills for you. Sometimes, your dental problems are obvious, like when you chip a tooth and need urgent dental care in Fayetteville, GA. Other times, it’s more subtle and insidious. You may think you’re saving money by not visiting the dentist, but spending a little money now can help you save a lot of money later on down the road.